Looking for a lower carb but still great tasting salad to take along to a barbecue or pot luck supper? 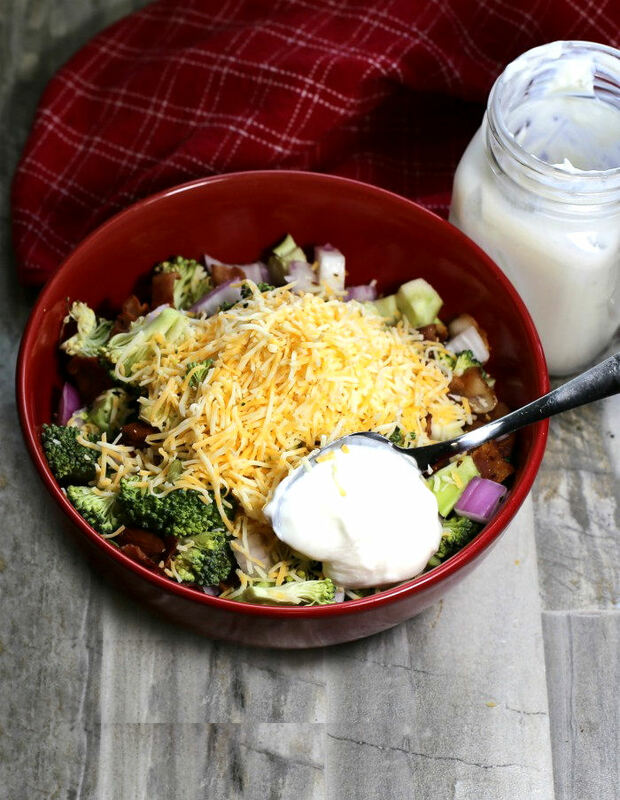 This keto broccoli salad with bacon and cheese is hard to top. Every time I bring it along to a party, it disappears! 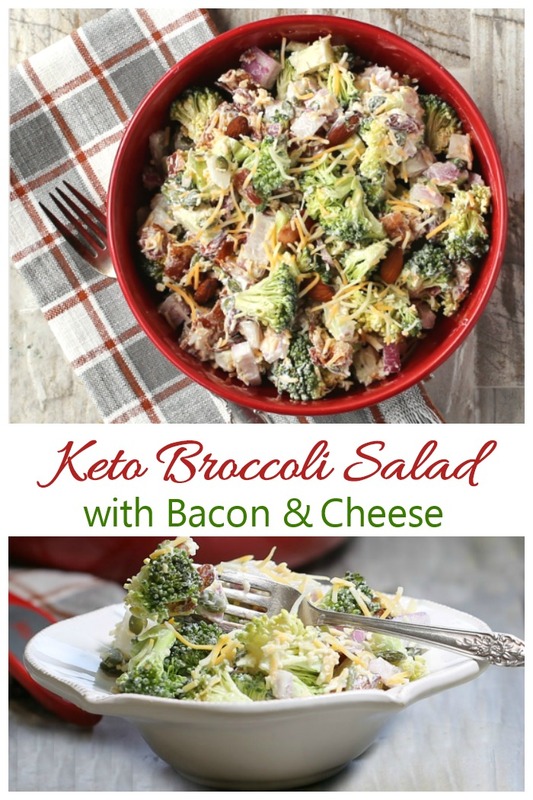 The salad is so easy to make and the bacon and cheese will make even the fussiest of vegetable eaters want to dig into the broccoli. It makes a wonderful side dish for any summer BBQ meal. Summer is the time for salads. They are so easy to make and portable, which makes them ideal for outdoor eating events. See my Mediterranean chopped salad and my Southern coleslaw for a couple more great healthy choices. This diet is referred to in many different ways. Some call it a low carb diet, some say keto or ketgenic and others call it low carb – high fat diet (LCHF). This diet has long been used as a good way to treat hard to control epilepsy in children. The diet forces the body to burn fats instead of carbohydrates and this appears to make the seizures less of a problem. I suffer from arthritis in one knee quite badly, so I tend to favor low carb eating to reduce inflammation. Many of my recipes are gluten free or fit the Paleo diet. Most of these recipes also fit into a keto diet plan. Lately, the keto diet has had a strong online presence with many celebrities touting it as a method for losing weight. For me, it’s all about cutting out sugar and carbs to control the pain in my knee so I adapt many recipes to make them lower in carbohydrates. There are lots of ways that you can slim down a normally heavy broccoli salad. 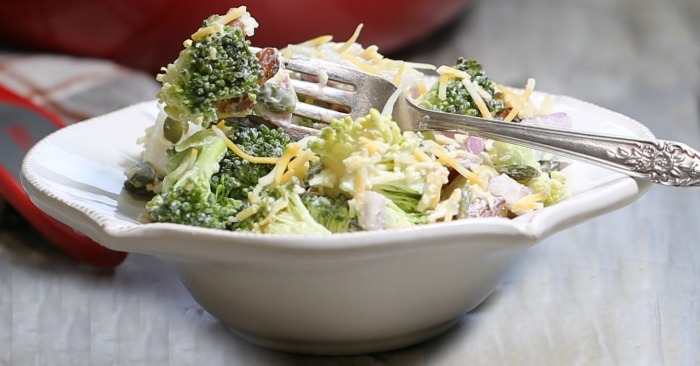 Most broccoli salads are loaded with both cheese and either use a lot of mayo or a calorie rich ranch dressing. Here are a few ways to slim down this type of salad and/or make it more healthy. And shhh…who needs to know it’s more healthy? Look at it! What a beauty! Substitute a light mayo for the normal version, or make your own dressing with Greek Yogurt. Limit the amount of cheese. Even though the keto diet is designed to be high fat, I always try to use less of higher fat ingredients such as cheese so that the dish has less calories when done. Limit dried fruits and add in nuts and seeds to give some extra flavor. 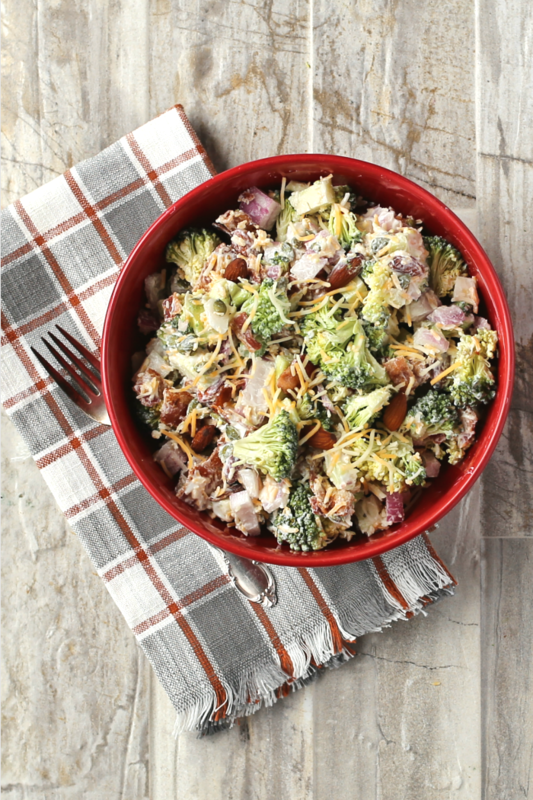 The key to the amazing taste of this salad is the combination of bacon and broccoli. This gives it a richness that a normal broccoli salad just doesn’t have and is a powerhouse of taste and textures. Note on cooking bacon. If you have the time, skip the frying pan and use your oven instead. This method removes a lot of the fat and the bacon still crisps up beautifully. 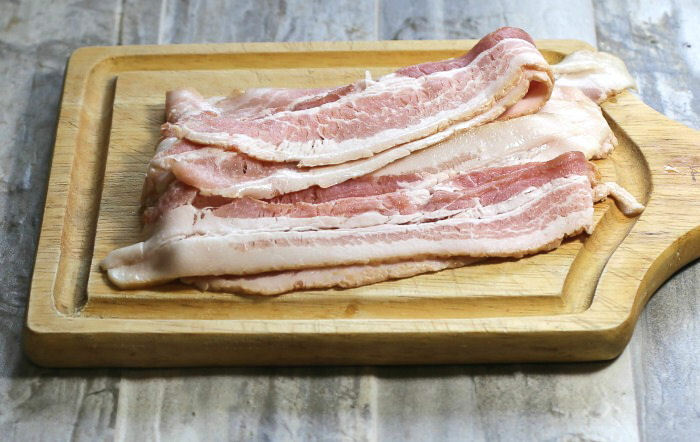 See these tips for baking bacon. Many broccoli salads are also loaded with dried fruit such as raisins and cranberries. This raises the carb level considerably as well adding to the amount of sugar in the dish. To offset the fact that I don’t use them, I chose to go with nuts and seeds for my add-ins to give both taste and texture. 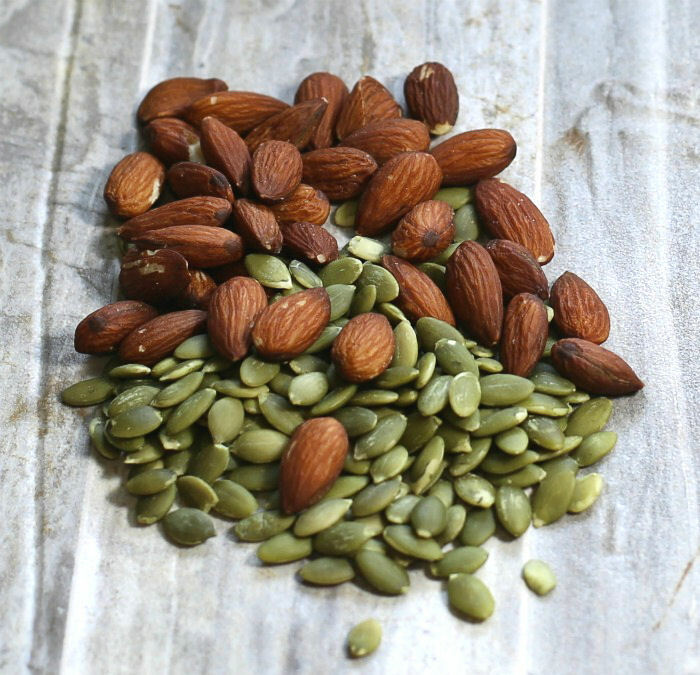 Pepitas (pumpkin seeds) and raw almonds give this salad a lovely crunch and a good dose of healthy fats. The salad is super easy to put together. Just dump it all in a big bowl and give it a mix. How easy is that? There is something great about a whole season which is tailor made for salads. So many recipes are a dump and stir variety. It sure beats slaving over a hot stove in the heat of summer! The only part that needs any cooking is the bacon, and you can do this the night before or earlier in the day if you wish and just assemble it the next day before you are ready to eat. Got a Mason jar, some Greek yogurt, Stevia leaf sweetener and Apple cider vinegar? Give it all a whisk and your dressing is done! The dressing can stay in the jar and you can shake it right before you dress the salad. The dressing has a delightful taste. It is quite tangy but both the apple cider vinegar and the Stevia leaf adds a sweetness to it that takes the tartness of yogurt out of the taste. It’s really, really good and will do a wonderful job of adding both sweetness and creaminess to the salad. The salad tastes best cold, so I make it early in the day and then just add the dressing and shredded cheese at meal time. This keeps the veggies from getting soggy. 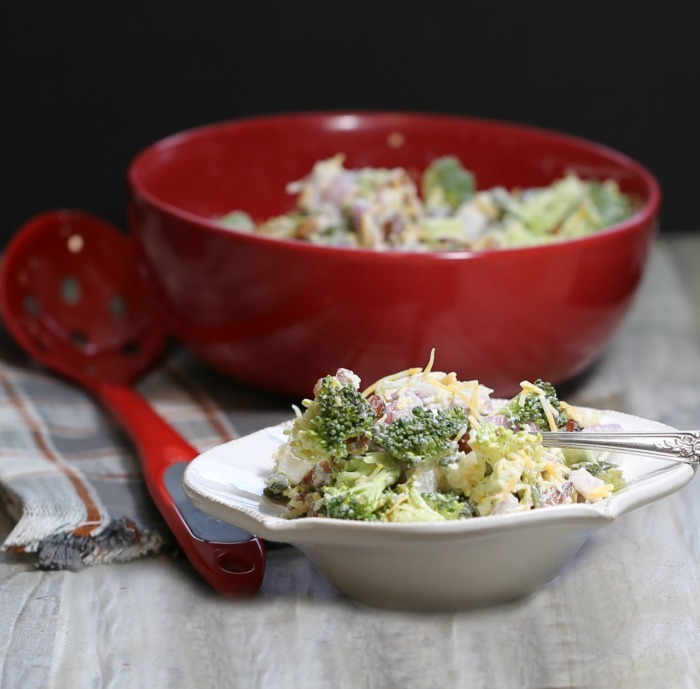 Every bite of this amazing broccoli and bacon salad is creamy, rich and delicious. The Greek yogurt dressing gives the salad a tangy/sweet taste and helps to save on some calories and fat, as well. The nuts and seeds add lots of crunch and shredded cheese gives it a rich flavor. The tasty salad is, hands down, one of my favorite picnic and pot luck take-alongs. The salad fits a gluten free, low carb and keto diet. It serves 6 and has 187 calories for each serving. It is high in protein and fiber and low in sugar. If you are following the Weight Watcher’s Diet, it has just 3 WW Freestyle points! This salad is made the traditional way with cheese. For a slimmed down version of it, check out this broccoli salad that features dried fruit and pecans instead. Looking for a way to remind yourself of this salad later? Pin the image below to one of your healthy cooking boards on Pinterest. Admin note: This recipe first appeared on my blog in October of 2013. I have added all new photos, some cooking tips and nutritional information to make it more complete. 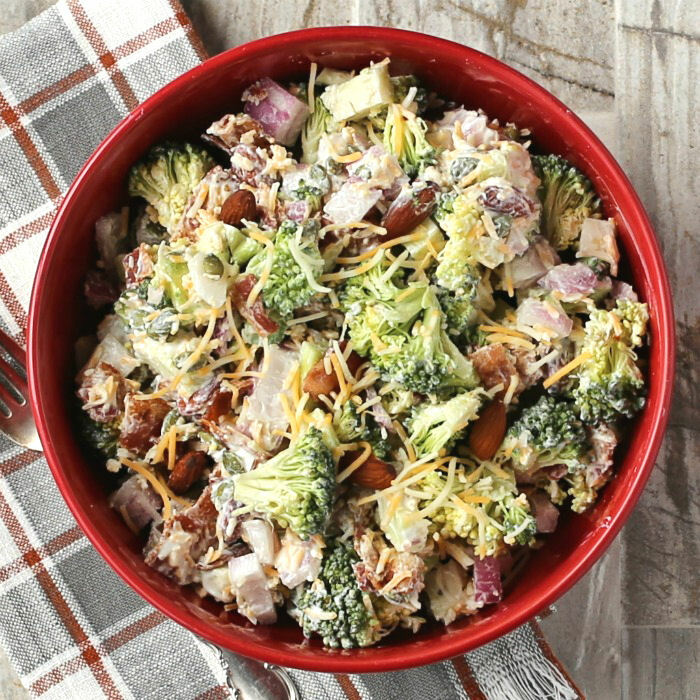 This tasty broccoli salad is hearty, and tasty and perfect to take along to a barbecue party or pot luck dinner. Shh....you don't need to tell anyone it's keto and gluten free. They won't guess! Cook the bacon and place on paper towels to drain. Chop and set aside. Cut the broccoli into bite sized florets and chop the onion. 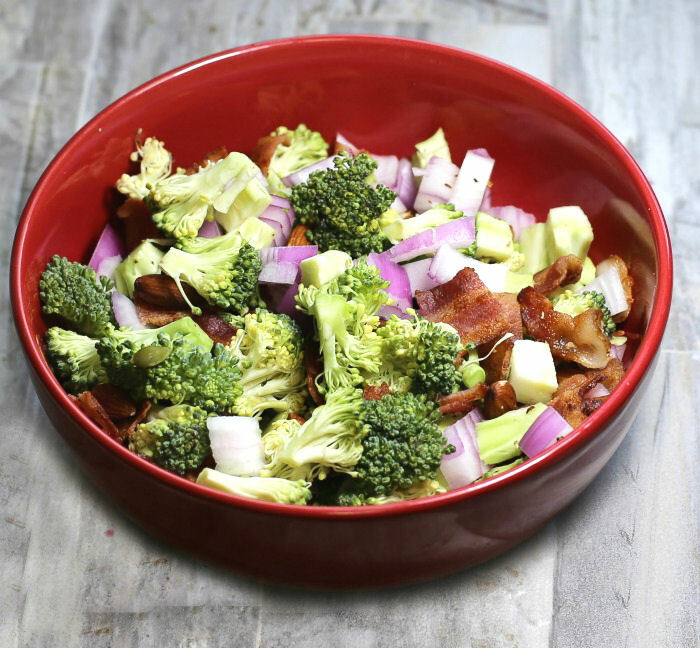 Combine the broccoli, onion, pepitas, bacon and almonds in a large bowl. 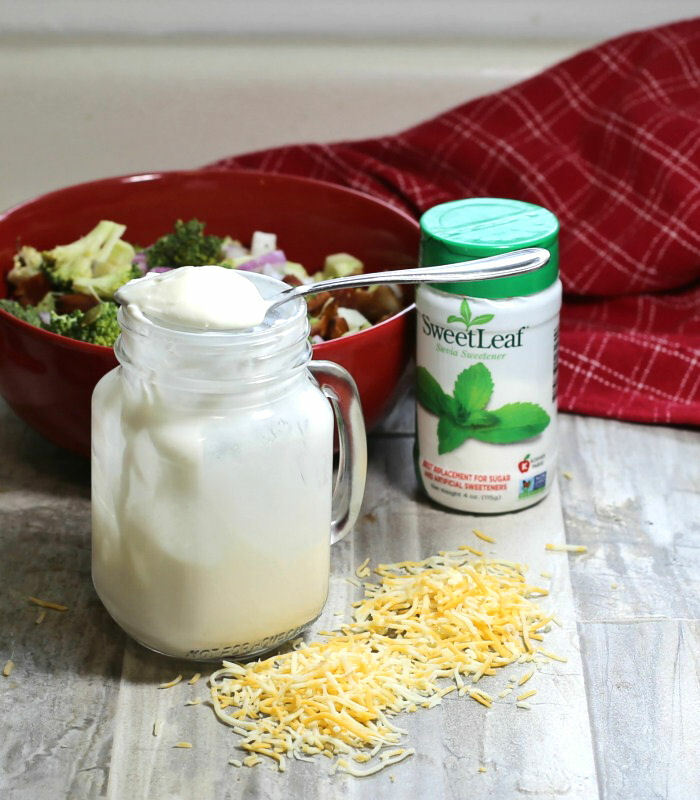 To make the dressing, combine the Greek yogurt with the Sweet leaf stevia sweetener and the apple cider vinegar. Mix well. Pour the dressing over the salad and combine well.The salad is best served chilled. Add the shredded cheese right before you are ready to serve.